Hello again! It has truly been design/sewing madness around here over the past month. I am knee deep in preparations for the book as well as spring market in Pittsburgh. How does time slip away so quickly? I have a LOT to do between now and May, but somehow, it will magically get done...amazing how that happens! I thought I would post today about one of my favorite tools for the sewing room. It is called pattern tracing cloth. Ever heard of it? I could kick myself that this stuff has apparently been around for some time and I was stupidly using tissue paper instead! 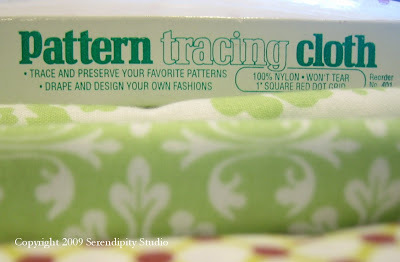 Pattern tracing cloth is a nylon product that is 36" wide. It is nearly transparent, making it a perfect tool for tracing patterns. It is especially helpful for me during my design process. 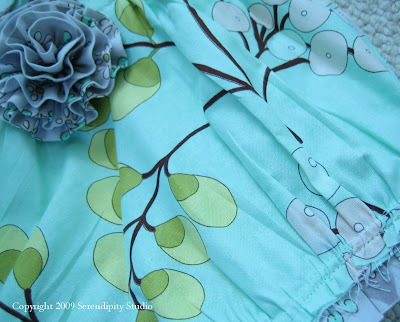 I use pattern drafting software for my skirts, tunics, and the newest jacket designs. Basically, these drafts are printed on large roll paper for me to test and tweak. The paper itself is a bit thick and terrible if you want to pin through it onto fabric, so I started tracing specific sizes onto tissue. You can just imagine how the tissue pieces were always too small, resulting in my having to tape several together just to get one piece traced...it was a ridiculous process and one that I hated! Not only is tissue (and we're talking gift tissue here) hard to handle, it tears easily too. You should have a really good mental image of the mess I had going! Well, not too long ago, I stumbled across this pattern tracing cloth. It is in one word, WONDERFUL! Because of its width, it is easy to trace big pieces, and it does not tear! The brand I use (Staple Sewing Aids) also has convenient red dots that are spaced 1" apart for easy expansion/contraction of pieces. I usually use a pencil or ballpoint pen to trace the pieces, cut them out, and use them multiple times. I know what you are thinking....how does this impact you if you are not a designer? Well, it is a great way to alter commercial pattern pieces for yourself. 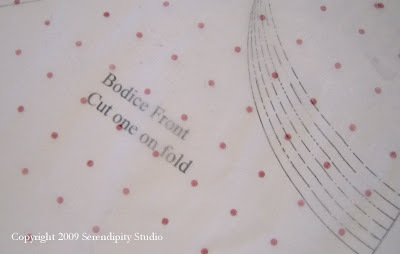 You can make the desired alterations to a piece and then lay the tracing cloth over the top and trace the altered piece. Label it, and you have a piece you can use for years to come. This tracing cloth is also wonderful for those patterns that come on regular paper that you have to trace to use anyway. If you can't find this product locally, you can purchase online many places. Sew Thankful, a nice online shop, has it in convenient 5 yard packages for a reasonable price. There are other websites as well where you can purchase it by the yard. If you do much garment sewing, this product is a godsend, so check it out. On the design front, it looks like there will be three new designs for spring market. 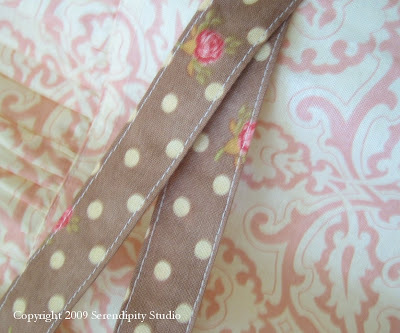 I will be posting sneak peeks of those soon, as the sewing progresses. Today, I have rather cryptic photos of some things I am working on for the book...can't say a lot about them, but thought you might enjoy the fabric combinations....truly yummy! Also, check out The Late Bloomer's blog. Elizabeth FINALLY finished her Sabrina tunic and it looks great. I secretly hope she wears it to market with a cute cardigan or something (hint, hint) so I can see it in the flesh, so to speak! 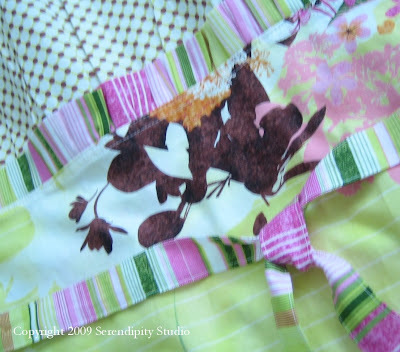 Have a wonderful weekend...hope you have time to get some sewing in!